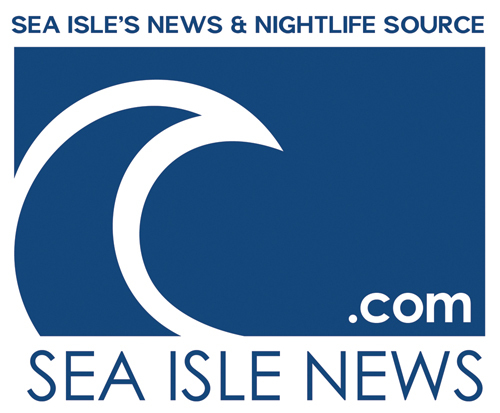 Thousands of revelers brave the frosty waters for Sea Isle's Polar Bear Plunge Saturday. 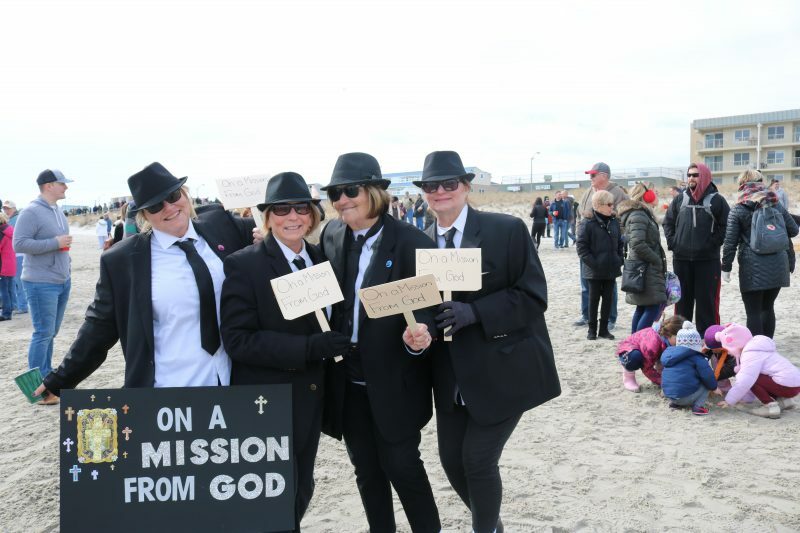 A bride and her wedding party, the Blues Brothers and even Santa Claus made an appearance in Sea Isle City on Saturday. 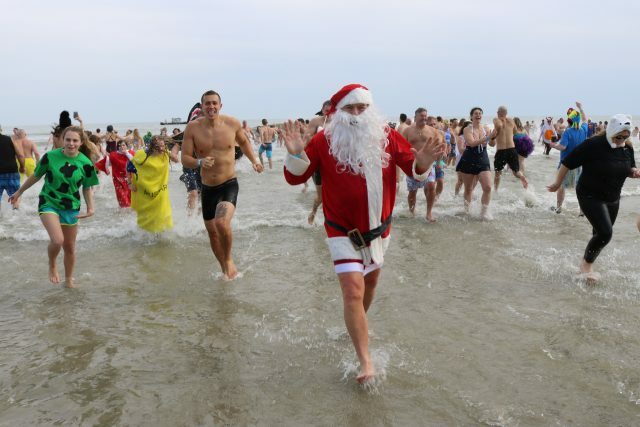 Well, not really, but these imposters were decked out to do something some may find a bit crazy — jump into the ocean, where water temperatures hovered around 39 degrees on a day of 41-degree air temperatures. Betsch, a college student, played the part of a bride during a fake wedding ceremony at the plunge. 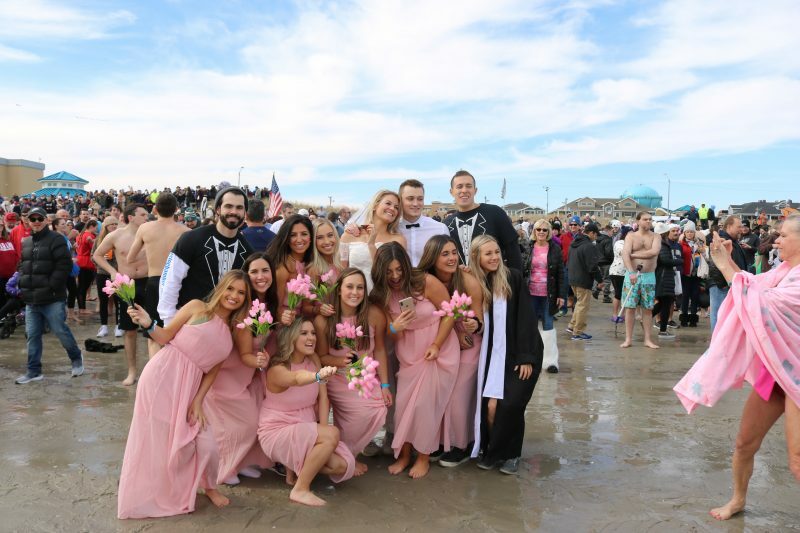 Her “groom,” Liam Gilbert, 22, of Mount Laurel, and their closest friends posed for pictures and geared up for the 25th annual Polar Bear Plunge. “I’m not a bride,” Betsch said reassuringly, despite wearing a flowing wedding gown. 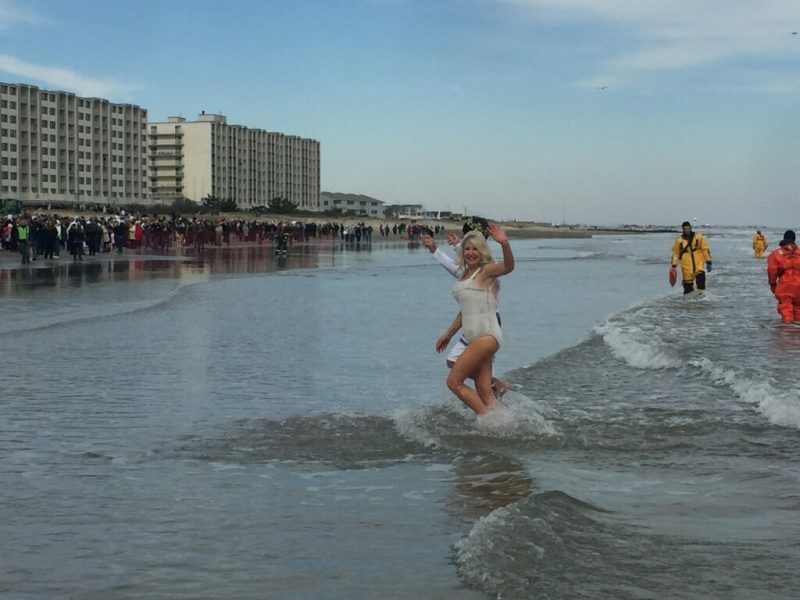 Thousands of revelers lined up on the beaches between 38th and 40th streets, while thousands of spectators awaiting the spectacle watched the participants take an icy dip. Pretend bride Casey Betsch, 22, and “groom,” Liam Gilbert along with their “wedding party” pose for photos before they venture into the ocean. The plunge offered a kaleidoscope of colorful characters clad in over-the-top costumes, including four women who were dressed virtually all in black while portraying the Blues Brothers. “We’re the Blues Brothers. 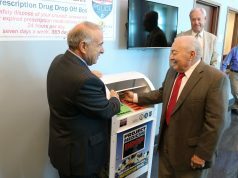 We’re on a mission from God,” Mary Vogelman deadpanned, repeating one of the iconic lines from the 1980 “The Blues Brothers” movie. 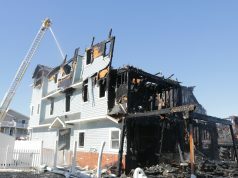 Vogelman, 78, was joined by her daughters, Patti Vogelman, 56, and Meg Vogelman, 53, and her cousin, Anne Dowling, 72. 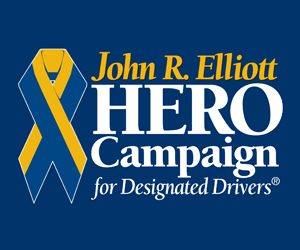 They are all from the Sweetwater section of Mullica Township in Atlantic County. Their black suits, fedoras, ties, shoes and sunglasses created a dramatic contrast with the white beach sand. However, they gave their getups a comical twist by wearing white socks, just like Jake and Elwood Blues from the movie. Family members do their best Blues Brothers impersonation. Mary Vogelman and Anne Dowling talked a big game minutes before everyone charged into the frigid surf. They promised to jump in all the way. “We’re going to dance right in,” Dowling said, shuffling her feet in the sand. When told that the water temperature was just 39 degrees, Mary Vogelman pooh-poohed the chilly conditions. “We don’t check that. We don’t really care,” she said dismissively. Plungers head out of the surf. 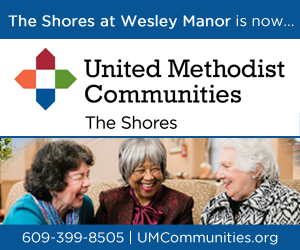 However, when it came time to take the plunge, Mary and Anne carefully tip-toed into the water, barely getting their legs wet. While many plungers dressed in elaborate costumes, others braved the nippy water wearing only swimming shorts or bikinis. John Earley, 53, of Lansdale, Pa., emerged from the surf soaking wet, clad in a skimpy bathing suit. 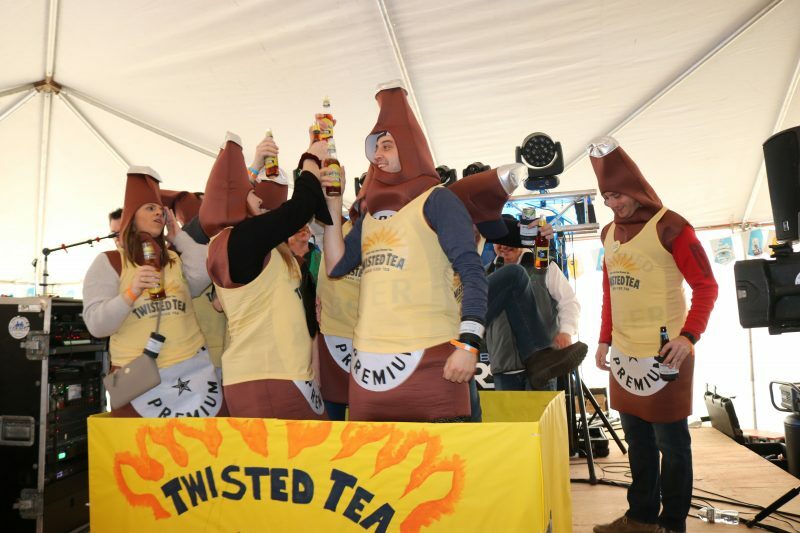 While some revelers took the dip for the first time, Katie Smith, of Vineland, and Laura Seay, of Stowe Creek, know the drill. It was their 17th year doing it. Katie Smith and Laura Seay do their 17th Sea Isle plunge. Their selection of attire for the chilly splash was bathing suits adorned in sea grass and other greens. Smith called the water invigorating, while Seay described it as numbing. 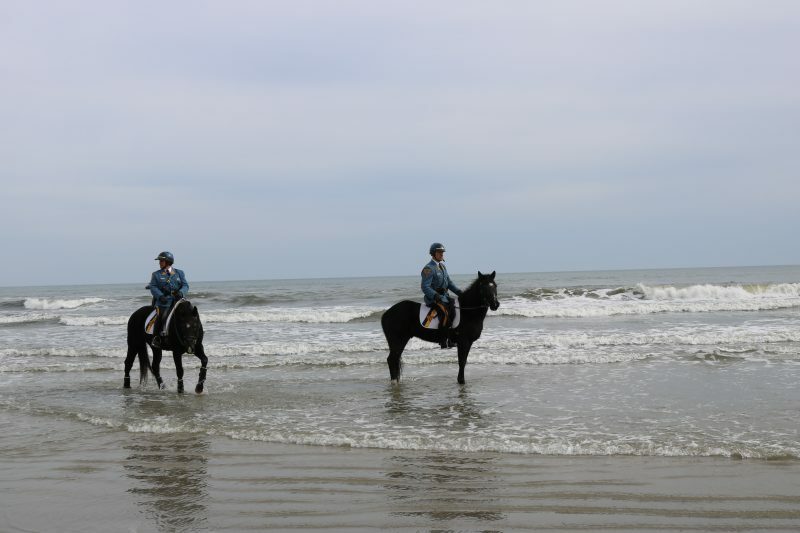 State Police troopers on horses along with Sea Isle police officers kept the crowds orderly. Beach Patrol Chief Renny Steele along with Patrol Lt. Mike Farley surveyed the crowds. Steele said everything was going well. Two hours before the plunge was a costume contest at LaCosta Lounge, where zany fun ensued. The city’s downtown streets were filled with families who headed to LaCosta Lounge for a Polar Bear costume contest. 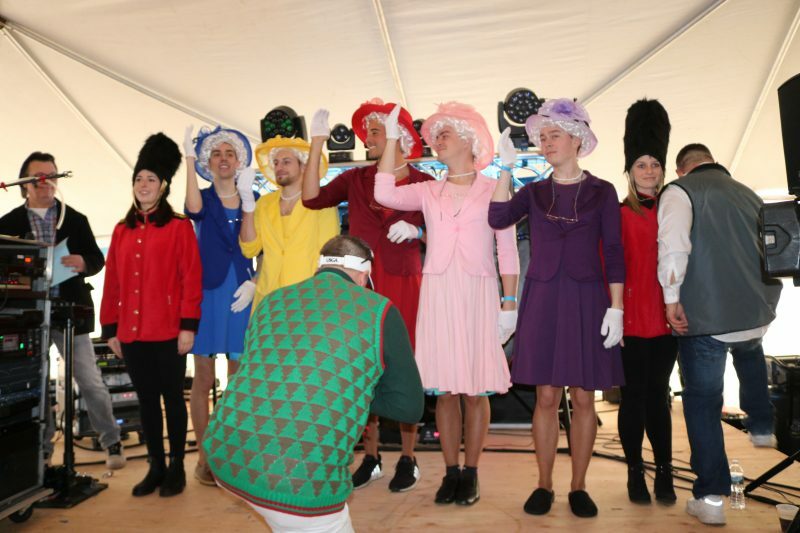 “God Save the Queen” was a hit among the costume contest crowd. Costume contest teams ranged from Noah’s Ark, to people dressed as the Queen of England for their number called “God Save the Queen,” which included two guards. The contestants were called to the stage to strut their stuff. Loud music played. LaCosta Lounge owner James Bennett emceed the event and crowds went wild applauding their favorite costumes. Dan McCalley, of Philadelphia, and his group of good-humored buddies, joked about their decision to put on dresses and dress like the queen. “I really like to dress like the queen,” McCalley joked. The excitement was far from over Saturday. LaCosta Lounge had a lineup of bands to perform into the evening. 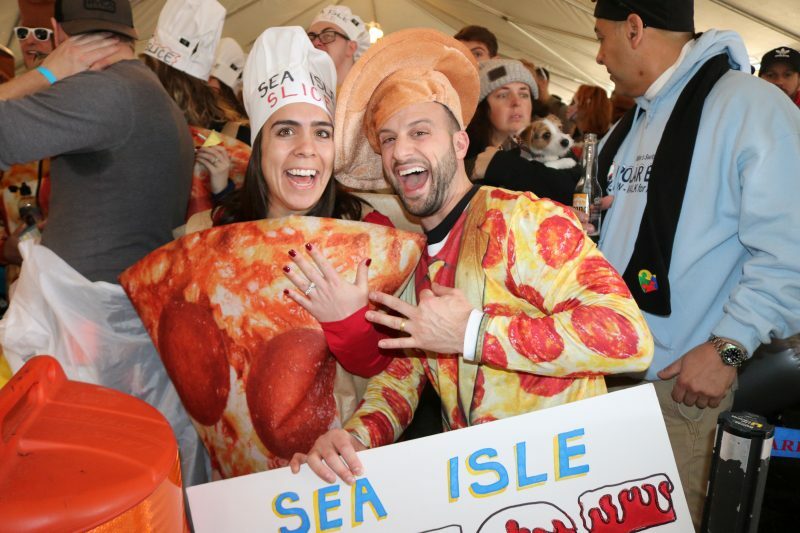 And festivities continue Sunday with the Mike’s Seafood Polar Bear Run and Walk for Autism, which gets underway at noon at John F. Kennedy Boulevard and the Promenade. At 3 p.m., there will be a baggo tournament at the LaCosta Lounge entertainment complex at the corner of JFK Boulevard and Landis Avenue. Newlyweds Gina and Louie Poulos Philadelphia show off their wedding rings before stepping up to the stage with their team. Best friends Grace McCallus and Lexi Freeman, both 23, of Philadelphia, get ready for the plunge. Polar Bear King and Queen 2019 come in from the chilly surf. John Earley, 53, of Lansdale, Pa., exults after emerging from the water completely soaked. State Police on their mounts survey the crowds.